The district of Sarawak, Malaysia is stretched in the tropical forest and the residents of this area are facing a drastic environment change ever since the logging operation began. 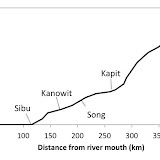 One example is the Rajang river basin (Fig. 1) where people witness serious riverbank erosion. According to the residents, the problem began to surface from the end of 1960s or 70s which coincide with the transition period of social economy in this area when logging operations in the forests and the service of express boats (speed passenger boats connecting towns along with the river) started. In this period, various high power vessels began their services and many people believe ship-generated-wave caused by those large vessels gradually but surely eroded the riverbank. But if we see the event from fluvial landscape perspective, maybe we should understand the situation is a part of long-term river channel process. 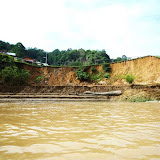 The riverbank erosion is easily to see in the middle and lower part of Rajang river (photo 1) where population density is relatively higher. While in some areas, riverbank protection is underway but the cause investigation of the erosion is not. This makes all measures ad hoc and their effectiveness is highly doubtful. Without sufficient knowledge of geomorphology regarding river channel form and its changing process and the assessment of the damage caused by the erosion, an effective measure is difficult to plan. Rajang river is more than 700 km and it shows many faces fluvial landscapes along its flow river channel. The river channel form path and flow regime must be taken into account for evaluation of riverbank erosion. We examined the topographical and hydrological characteristic of Rajang river, especially in the regions crucially damaged by riverbank erosion. As the river runs tropical area, it is different from Japanese rivers in many ways. As the amount of precipitation in this Rajang river area is almost doubles that of Japanese annual mean precipitation, the river flow volume of the Rajang is far larger than Japanese rivers. Furthermore, the weathering rate of rock is quite rapid, because this area has humid tropical climate. To understand the changing process of fluvial landscape in this area will be significant as an assignment of geomorphology. As mentioned before, this low-lying area is the center of the local communities. How local people cope with the environmental transformation symbolized by the riverbank erosion gives us an intriguing research topic. Here is a tentative report of our research, based on field study in March and August of 2010 on the situation of riverbank erosion and its influence on the local communities. Rajang river runs through in the middle of the state of Sarawak. The river is the longest and the largest in Malaysia; it is 760 km in length and has a drainage area of 50,000 km2. The headstream is located in Iran Mountains that divides the state of Sarawak and Indonesia. The river runs into the center part of the state and reaches the South China Sea. The study area is covered by Paleogene mudstone. The main ridge along with the strike of bed stretches in the east-west by the pressure from north-south direction of the Indo-Australian Plate movement. Thus, Rajang river runs along the subsequent valley. Fig. 2 illustrates the river’s longitudinal profile. The stream gradient is considerably lower than Japanese rivers: the elevation of the river is merely 55 m at the town of Belaga, approximately 435 km away from the mouth of the river. 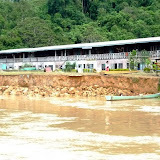 The river runs through mountain area till it reaches Kanowit and from there, the landscape changes into alluvial plain. The river channel meanders through delta plain beyond Sibu. This delta plain of peat layer was formed in the Holocene epoch (Gastald, 2010). The area lies in tropical rainforest climate. 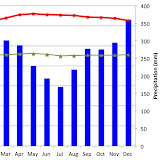 Precipitation during June to August is relatively low while it rains a lot in December and January (Fig. 3). This makes the flow of the river show considerable seasonal changes through the year. 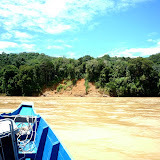 We observed the landform, the flow and the bank erosion of the river, taking a boat from the river mouth to the town of Belaga. We classified the patterns of channel form based on our observation results, topographical maps, geological maps, aerial photos and satellite image. In order to confirm the distribution of riverbank erosion (its scale and range) we recorded the erosion sites on the topographical maps with a scale of 1 / 50,000 and made a distribution map of riverbank erosion along the river using GIS (Geographic Information System). At the sites where severe erosions were observed or showed characteristic landforms, we conducted in depth observation by chartering a longboat (a small vessel for daily use for local residents). In some erosion sites, we paid visits to longhouses and primary schools along the river to conduct interviews with the residents and teachers. From Kanowit to Belaga, we observed many erosion sites and we described their distribution and characteristics. 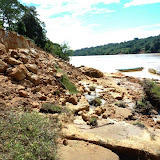 As a result of our field research, we found 225 sites of erosion along a-265 km section between Kanowit and Belaga. Fig. 4 illustrates the distribution of erosion sites near Kanowit, approximately 165 km from the mouth of the river. The direction of river channel is displaying geological strike. While the zone indicated in Fig. 4 is less than 20 km of distance of approx. 265 km of our research area, there are 35 sites of erosion. Based on geomorphological characteristics and distribution pattern of erosion sites obtained from our field work, we grouped landforms of riverbank erosion of this area. The erosion types of this area are divided into following patterns. Type I: slope failure, type II: erosion in slip-off slopes and linear channel, type III: erosion in undercut slopes. Type I (Slope failure) shows shallow landslide on riverbank slope. In any sites this failure can be observed gravels from collapsed ground were piled up upon sediments such as sand and mud. This heap of gravel was quite unstable and it was difficult to climb up (Photo 3). Those sites were, however, covered with trees and weeds before. Type II can be found in erosion sites in the inner side of a curve of the river and in the linear part of the river where the influence of stream of river flow is relatively small. A riverbank with gentle slope has been eroded and turned into a sudden vertical drop (Photo 4, 5). The cycle of dry and rainy seasons and a drastic fluctuation of water level of the river are major causes of the erosion. The residents in this area pointed out the influence of the waves generated by large vessels such as express boats. Looking closely at the sediments piled up under the vertical drops, in some spots, we found different kinds of wastes: grass shards, wood chips, and concrete pieces. In such spots, those rubbles might erode the bank of the river especially during flooded season with the help of the ship waves. Many residents are forced to dwell in narrow flat areas upper part of the riverbank. Type III can be found in water colliding fronts where a river meanders and water stream concentrates on the curve. Major factor of this area’s erosion could be attributed to the flow of the river. 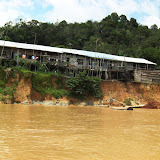 In the middle and lower part of Rajang river we witnessed many longhouses, schools and even towns (shop houses) were in jeopardy because of riverbank erosion (Photo 6). 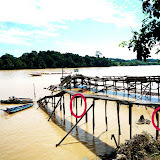 In fact, according to the residents, many longhouses have been lost due to the erosion. Landing bridges, installed in the riverbank are needed to be fixed or rebuild in every few years because of the erosion (Photo 7). Fortunately the speed of erosion is not so fast; the river eats away its bank a few meters each year. This allows the residents to disassemble their longhouses for relocation in the back of flat area. This may seem the solution for the problem but the cost issue is no small matter for them. The forest surrounding their residential area is no longer rich enough to fulfill their needs, so they have to purchase building materials in town. Most good flat areas to build new longhouse (river terraces) have been bought up by the ethnic Chinese farmers for over the century. As a result, not a few residents have trouble to find the new place to settle down. Some residents go so far as to say, “Our lives at stake because of those greedy Chinese.” This clearly indicates the problem of riverbank erosion in Rajang river is no longer a simple natural disaster but a social issue that includes the potential crisis of ethnic problem as well as land issues. In order to get the gist of the erosion issue of Rajang river and its impacts on the local communities, we made a distribution map of the erosion sites and sorted them into some categories. In addition, we conducted interviews to the local residents. Based on the geomorphic characteristics and distribution patterns, the erosion pattern in this area can be divided into the following categories. Type I: slope failure, type II: erosion in slip-off slopes and linear channel, and type III: erosion in undercut slopes. The issue significantly affects the daily lives of the local residents and it has a potential impact to bring on ethnic problems in the local society. 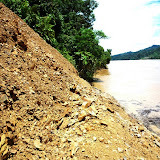 Further data accumulation and its analysis are needed to speculate on the cause of the erosion on the bank of Rajang river. It is premature to pin down the cause of landform change to hot and humid tropical environment of this area and its high weathering rate or this is the product of social change as many local residents believe that it is a disaster resulting from acts of human beings. We need to carry on further research from the viewpoint of river geomorphology. We also need to pay attention to see what does landform changes along Rajang river area bring along to the society of its riverine society. Gastaldo, R. A. 2010. Peat or no peat: Why do the Rajang and Mahakam Deltas differ? International Journal of Coal Geology 83: 162-172. This entry was posted in Report of Research and tagged bank erosion, boat generated waves, Hiroshi Ikeda, Kazuhiro Yuhora, Kuniyasu Mokudai, Rajang River, river bank, Ryoji Soda, Sarawak @en, slope failure, Takuma Watakabe, undercut slopes. Bookmark the permalink.